We returned from Toronto Trip 3 Tuesday evening last. The good sister had died and the funeral had been done, and we had reached the limits of what we could reasonably do without breaking off and coming home to rest. I have been running about on the 401 since I entered University in Canada. Since then, the 401 has become a rosary of municipal traffic jams interspersed by sections of posted 100 kph usually buzzed through at 118 kph. Toronto's part of the 401 has always been busy, but now once you leave the Toronto Crush, there is the briefest of respites until you fall into the Mississauga Maelstrom, followed by the Milton Mess, and topped off by the Kitchener Klatsch, meaning a Traffic Klatsch - which is a imaginative modification of "Verkehrstockung"... or, traffic jam to my mind. I think of these slow downs as a meeting of like-minded individuals who get together into their steel mobile automatons and share their love of gazing at still-life pavement underfoot. Trip 1 was back in December, when we got together to make funeral plans. Trip 2 was early January when she entered palliative care at Sunnybrook - a cruel play on words if there ever was one. Trips 3 was the funeral, and Trip 4 will be closing up the house. It is amazing how many things I did I thought I'd never do again. This amazement is much noticed these days as people become dependent upon your assistance. (it was much colder in Toronto than it was back in Michigan, and it snowed every day, so much so that since side streets were sketchy to begin with and afforded little chances for parking at the various houses and places we were going to, the additional snow rendered the streets inimical to parking, and it became sort of Goya's version of "Parking During The Peninsular War". - and it was one of those winter drives into the wind during which the windshield wipers grumble like unpleasant camels, who do not wish to be goaded into action, and every 3 minutes or so, you watch as the accumulation of ice on the far left side of the driver's side of the windshield creeps ever so slowly - but majestically! with all the imperium of a relentless glacial age! - towards the right: the area where the blasting hot air has managed to maintain an upper hand for the time being. So you crank up the heat and strip off your coat and try to keep the windshield ice-free. I haven't had to do this since I retired. 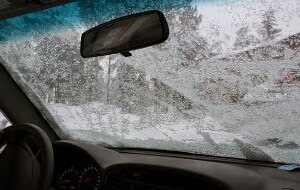 Simply put, if it is raining ice and the wind is blowing, I do not go out for a drive now. Even when my parents were 60 miles away. They lived less than a mile from the main hospital, and if there were an emergency and the weather were inclement, I told them that I bet the local EMS would get to them before I could. It took some repetition for them to believe this. 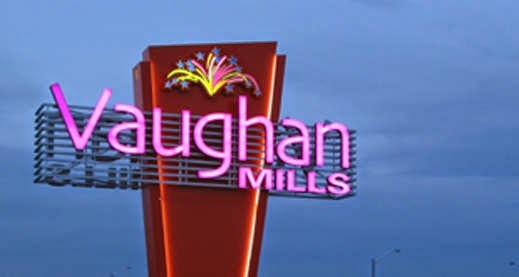 We spent a bit of time in Vaughan Mills, and the ice had become medium snow. That combined with the fact that the wind would be behind us on the trip back made the return trek less Donner-Party-like than the trip out. Does The US Government Support Terrorism? Somebody Thiefed My Anecdote ! Finally! A Panda We Can Bring Home!